Founded in Silicon Valley, Startup Grind has now hosted 2,000 fireside chats since its founding in 2010. To date, Startup Grind has helped millions of entrepreneurs find mentorship, connect to partners and employees, pursue funding, and reach new users. Tian Luan is working at the management company of Innoway, which is the heart of startup eco-system in China. He is in charge of several business modules including Global Incubation, Large Corporations Collaboration, Online and Offline Platforms, Startups Mentoring. He also researches cross-border e-commerce, helping international startups interested in Chinese market. CHEERS is kindly offering a free flow of wines during the event to help get those creative minds flowing. Startup Grind is the largest independent startup community, actively educating, inspiring, and connecting 400,000 founders in over 200 cities. We nurture startup ecosystems in 85 countries through events, media, and partnerships with organizations like Google for Entrepreneurs. The cornerstone of our global community are monthly events featuring successful local founders, innovators, educators and investors who share lessons learned on the road to building great companies. Founded in Silicon Valley, Startup Grind has now hosted 2,000 fireside chats since its founding in 2010. 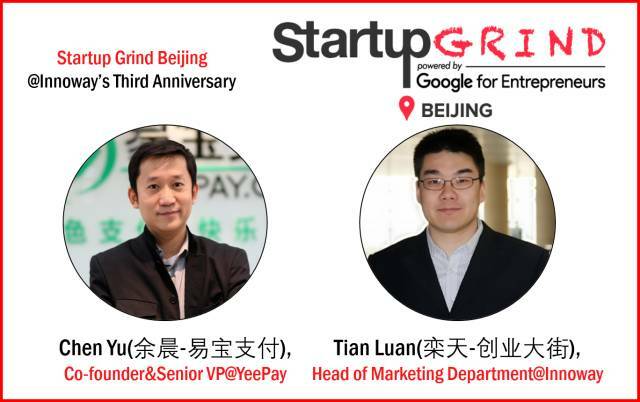 To date, Startup Grind has helped millions of entrepreneurs find mentorship, connect to partners and employees, pursue funding, and reach new users.